The government is committed to strengthening the pathways to postsecondary education and training for Indigenous learners, while recognizing and building the capacity of the nine Indigenous-owned and -operated Aboriginal Institutes in Ontario. That is why the Province is investing about $200 million over three years to support key initiatives that will help more First Nation, Métis and Inuit learners access high-quality postsecondary education and training opportunities. This includes an investment of $56 million over three years to enhance the capacity and sustainability of nine publicly funded Aboriginal Institutes in Ontario. This historic investment in the sustainability of Aboriginal Institutes supports the shared goal of increasing educational access and opportunity while providing certainty for Indigenous learners in Ontario. The institutes provide a pathway for Indigenous learners to successfully advance their educational and career goals in culturally appropriate and safe learning environments that are close to home and are run and governed by Indigenous communities. They offer postsecondary education and training programs, in direct response to local labour market needs, to over 1,000 students annually. On average, about 300 learners graduate from Aboriginal Institutes every year. The investment also reflects broader government priorities, including reconciliation with Indigenous peoples and the development of a highly skilled workforce. 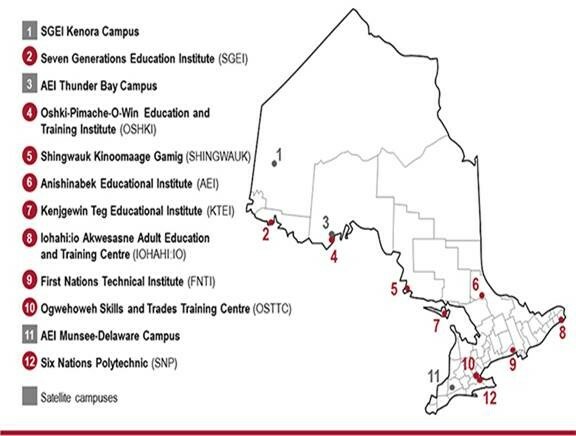 Aboriginal Institutes in Ontario deliver a wide range of accredited postsecondary programs in partnership with colleges and universities. These institutions also develop curricula to address the current and future human resource needs of local communities. The First Nations Technical Institute operates a flight program, in partnership with North Bay’s Canadore College, which is the only Indigenous postsecondary aviation program in Canada. The Bachelor of Arts degree in Ogwehoweh (Cayuga and Mohawk) Languages at Six Nations Polytechnic Aboriginal Institute in Ohsweken, started in January 2016. The Board of Directors of First Nations Technical Institute and I would like to congratulate the Government of Ontario for their historic investment of $56 million in additional funding for Aboriginal Institutes. This long-awaited support is a positive step on this journey to reconciliation. It exemplifies that by working together with Indigenous partners, the government of Ontario is responding to the Truth and Reconciliation Committee’s “Call to Action” and earnestly acting to establish a solid foundation of mutual respect and consultation. We applaud your recognition of the vital role that Aboriginal Institutes perform to bridge the gap in post-secondary attainment for Indigenous learners. Our common goal of strengthening education and training will lead to far greater success rates by addressing the challenges faced by our Indigenous learners. This enhanced funding will increase our capacity to provide culturally appropriate education and to make meaningful change by reflecting the spirit and intentions of the TRC. There is still much work to do to narrow the gaps in social, economic, education and health outcomes, however, the government’s willingness and desire to work with Indigenous partners on culturally relevant and responsive policies and programs, will lead to inclusive and beneficial outcomes for all.